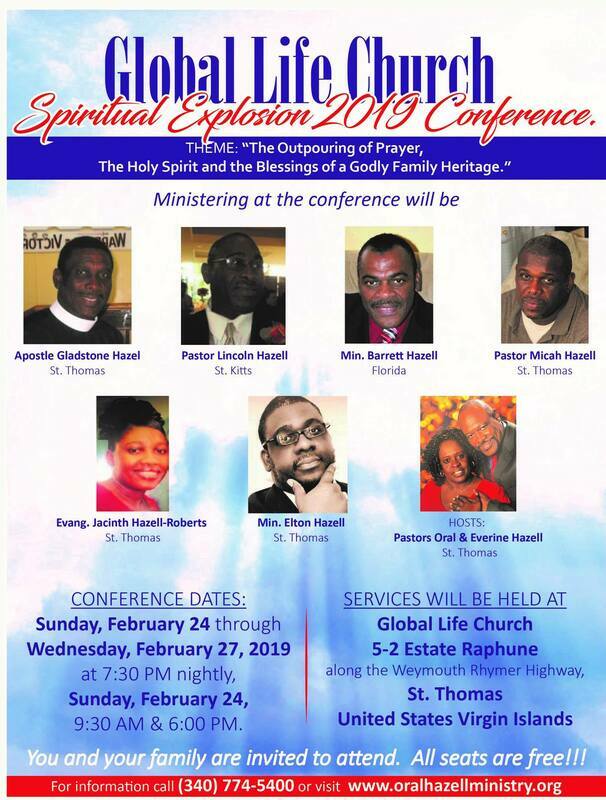 Conference dates: Sunday, February 24 through Wednesday, February 27, 2019 at 7:30 pm nightly, Sunday, February 24, @ 9:30 AM and 6:00 PM. Ministering at the conference will be Apostle Gladstone Hazel, St. Thomas, Pastor Lincoln Hazell, St. Kitts, Min. Barrett Hazell, Florida, Min. Micah Hazell, St. Thomas, Evang. Jacinth Hazell-Roberts and Pastor Oral Hazell, St. Thomas. The Matriarch of the family will also be featured, Mother/Pastor Norma Hazell, St. Thomas. All services will be held at Global Life Church. Services will be held at Global Life Church; 5-2 Estate Raphune along the Weymouth Rhymer Highway, St.Thomas. You and your family are invited to attend. All seats are free!!! For information call (340) 774-5400 or visit www.oralhazellministry.org.